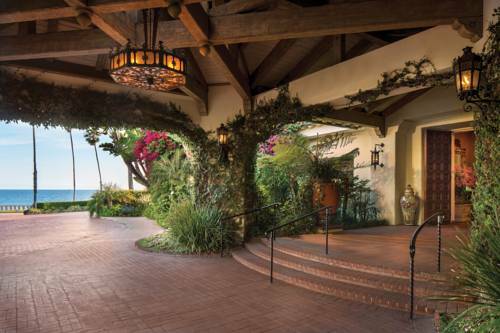 A legend since opening in 1927 Four Seasons Resort The Biltmore Santa Barbara offers the grandeur of a Spanish Colonial estate set in lush gardens next to pristine Butterfly Beach. Bella Vista: Bella Vista showcases organic Italian-inspired California cuisine. Indoor and outdoor dining available. Open daily. Tydes: Overlooking the ocean at the Coral Casino Beach and Cabana Club the restaurant offers modern seafood with sophisticated oceanfront dining exclusively to resort guests and club members. Open daily. Coral Cafe and Bar: Casual poolside dining including grill items and traditional favorites such as burgers salads and sandwiches. Located at the Coral Casino Beach and Cabana Club. Open daily. Fins: Energize your day with delicious fresh-made juices and healthy light fare at Fins - our organic juice bar in Santa Barbara. Choose from made-to-order organic juice blends or create your own custom juice. Coral Reef Bar: Guests of Four Seasons Resort The Biltmore Santa Barbara can now experience Californias first Coral Reef Aquarium Bar. In room dining: A fine dining experience within the comfort and convenience of your guest room or suite. Choose from an extensive menu day or night that is ideal for time-zone-hopping travelers impromptu meetings or for quiet private dining. Located in the exclusive neighborhood of Montecito. Hotel is set among 22 acres of lush gardens just steps from the Beach and the Pacific Ocean.